Embleton Vicarage was originally an early 14th century rubble stone fortified house, founded by Merton College, Oxford. 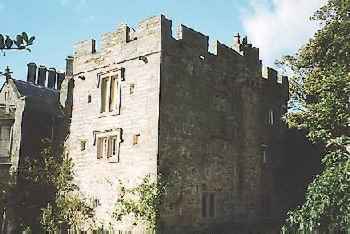 In the late 14th century, the 'Old Vicarage' was absorbed in the construction of a rectangular three storey vicar's tower house, with two ground floor segmental-vaulted chambers. To the west is an irregular H-plan wing, which consists of a mid 18th brick kitchen and a Tudor style stone extension of 1828. The south end of the tower was also refaced but there is still a blocked first floor doorway on the north side. 2 miles south-east is Dunstanburgh Castle and 4 miles north-west is Preston Tower. Embleton Vicarage is located in the village centre, off the B1339. 30 miles south of Berwick-upon-Tweed, on the A1-B1339. The site is visible from the Holy Trinity churchyard.